A number of blockchain startups are targeting consumers with token-based loyalty programs that allow them to move loyalty benefits from one product to another. Tokens make loyalty points ‘liquid’; they can be transferred, cashed out or converted into cryptocurrencies. Try telling American Airlines you’d like to spend your points on white wine or paying off your mortgage. But this is not about existing initiatives. It’s about a couple of JasperCoin innovations which will dial up the relevance of crypto as a marketing tool. By using an alternative to the Bitcoin protocol, Jasper makes the mining of cryptocurrency possible by the technically-challenged and not dependent on high powered computers. In other words, people will be able to mine it on their own computer. It will put crypto into the hands of millions. Here’s what has been holding cryptocurrency back as a transaction medium: centralization of mining has limited coin creation to a small number of mostly Chinese enterprises with access to cheap, coal-fired power plants. Five companies control over 70% of Bitcoin mining. Low cost, accessible mining will change all that. Here’s the other game-changer. We are about to see plug and play miners. Because JasperCoin dispenses with CPU power as the reward mechanism for miners, it can construct mining rigs cheaply. Esto es un cambio disruptive. Estamos a punto de ver en el Mercado, dispositivos mineros plug and play. Debido a que JasperCoin no necesita alto consumo de CPU como mecanismo para minar, es posible minar con un simple dispositivo con consume eléctrico mínimo. Turn it on, connect it to your WiFi and it starts mining. No geek required. Consider all the people who have wanted to mine Bitcoin but have found the process too intimidating. Those days are numbered. The coins you mine at home are a digital currency, convertible to cash. As you earn them, they’re added automatically to the digital wallet in your phone. Now you can spend them anywhere that accepts digital currency. If you want to mine Jasper for beer, you’ll redeem them at the bar. If you want to mine chocolate there’ll be chocolate companies that accept Jasper. When consumers have it in their hot little hands, companies will see it as a source of new business. High-profile promotions will create momentum. It’s low cost compared to setting up their own loyalty program or joining someone else’s branded rewards program. All give-aways can be done as digital transactions. It’s easy. At a minimum, all they have to do is put up a Jasper logo. They can mine Jasper themselves. Companies can dedicate spare computer capacity to mining Jasper. They can give JasperCoin to their customers as ‘coupons’, gifts or loyalty rewards, to their employees as perks, to distributors as incentives or to charities as donations. Companies can create promotional projects with each other, with all bookkeeping done on the Jasper ledger (all transactions are published). For example, a gym might want to offer its members discounted running shoes. They could publish an offer to shoe retailers that rebates them for any sales generated. Sales would be tracked on the ledger. Customers could purchase direct from the retailer using JasperCoin and a portion of the sale would be automatically rebated to the gym. In this way companies can leverage their customer base for purchases made elsewhere, not just their own normal sales. The novelty of spending some of your computer’s excess processing power on real world goods will generate considerable social media activity. Early movers will profit from this. It is in Jasper’s interests to promote offers put together by corporates. The more quality offers that exist, the more valuable the coin becomes. 1. Cryptocurrency will be a marketing tool when it is in the hands of enough consumers. JasperCoin lets people and companies convert excess computing power into crypto. 2. Instant, fool-proof mining hardware is coming, in the form of the Jaspberry. That will further spread the amount of JasperCoin mined. 3. Companies can sell their products for JasperCoins, which can be converted into cash. The novelty value of this, and dedicated ‘mining for chocolate’ machines will increase the awareness of cryptocurrency as a transaction medium. 4. Loyalty programs are where the action is, but loyalty will be liquid, rewarding transactions everywhere, not narrowly. As well as loyalty schemes, companies will generate sales and profit by marketing other companies’ products to their customer base. 5. As a loyalty program JasperCoin will be extremely cost-effectively and flexible. Companies can mine their own Jasper and give it away in any form. All of this will occur over the next few years. Mainstream and social media will record and amplify every step. We are twenty five developers working in Argentina, Uruguay, Mexico and Australia on JasperChain, a new blockchain, and JasperCoin, a cryptocurrency for the non-technical. 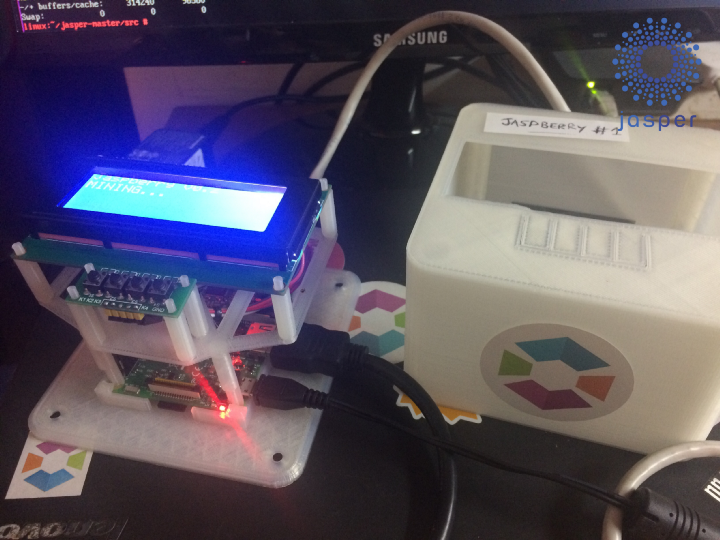 Jaspberry is our plug and play device which earns crypto that actually buys things. Fundraising for the project via an ICO commences Q2 this year and the company is now accepting pre-sale contributions from angel investors.